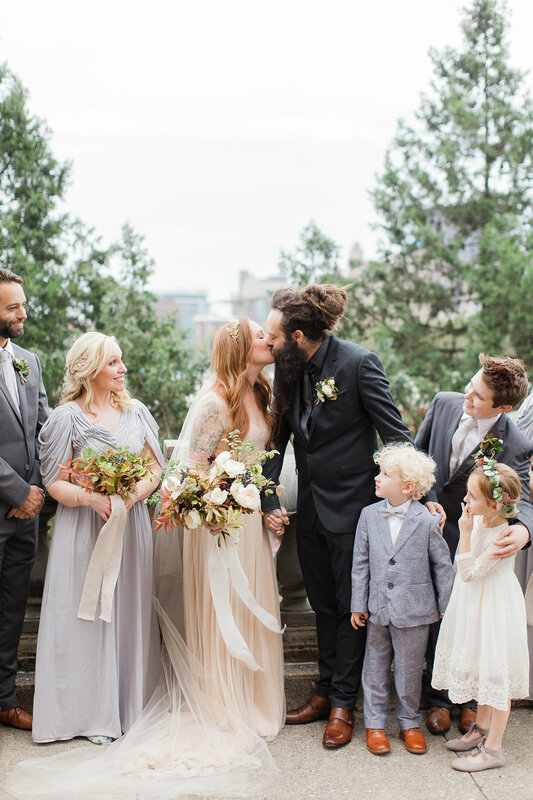 Have you ever heard of a popup wedding? 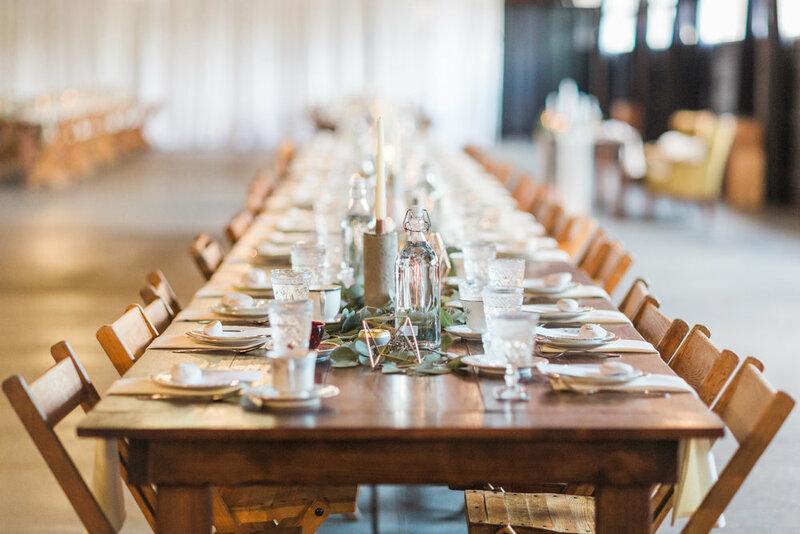 A popup wedding is an intimate 90-minute wedding planned from start to finish by Gem City Popup Co/Something Old Dayton. 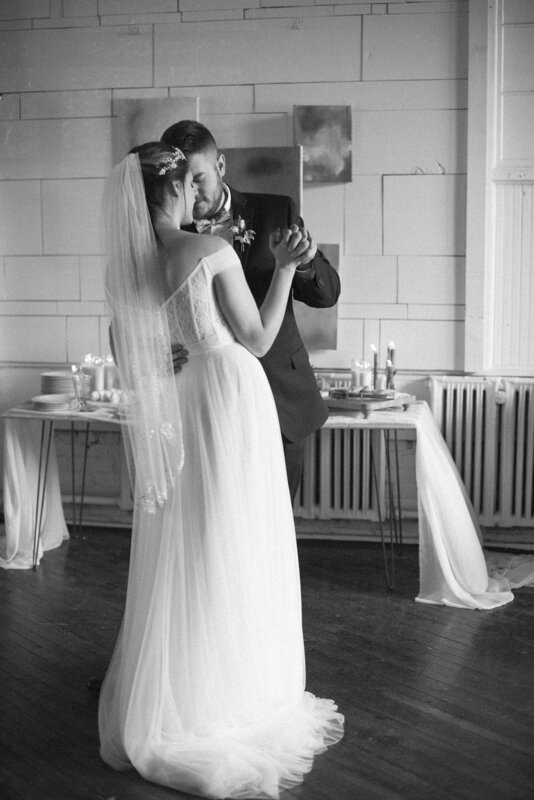 We plan a singular event at our studios in Dayton, Ohio, in which up to 3 couples can get married on one day with all the flair of an artfully planned wedding, at a fraction of the price. We hit all the beats of a standard full size wedding while saving you the stress, time, and money involved in planning a full scale event. 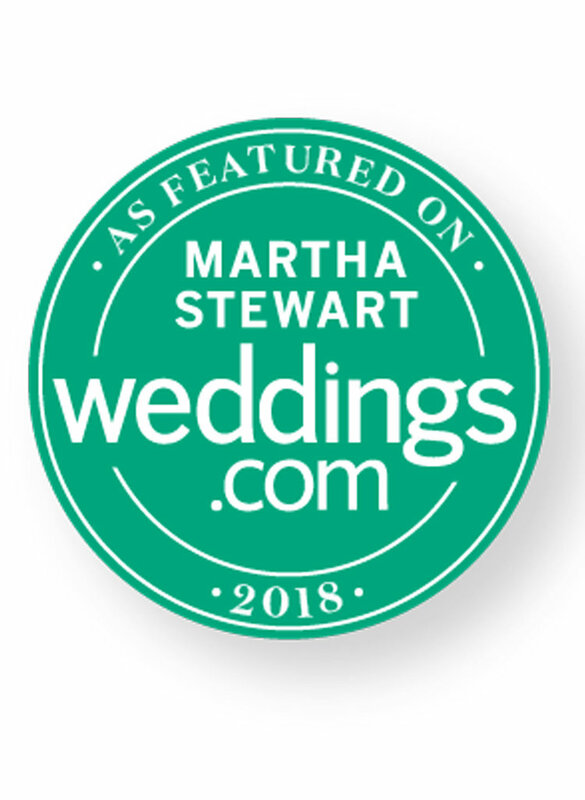 We choose some of the best Ohio wedding vendors to design a unique and expertly styled wedding experience with none of the stress and a fraction of the price. 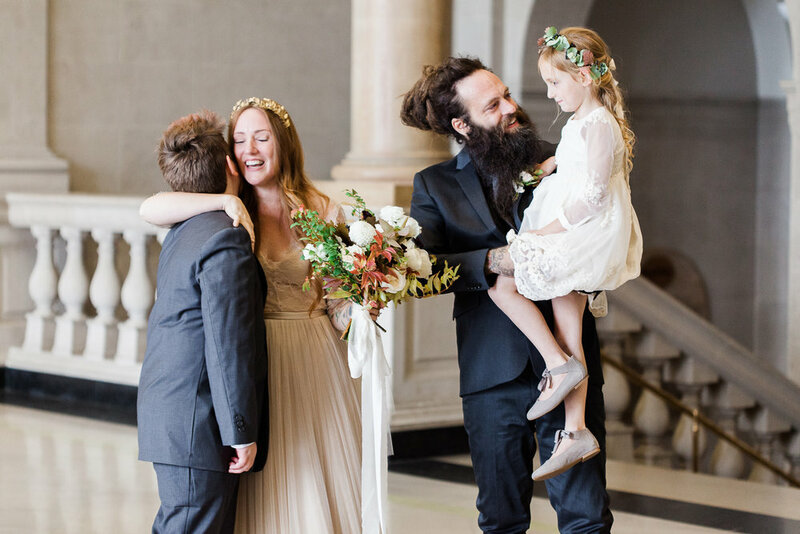 In June we hosted a popup wedding designed around Pantone’s color of the 2018, Ultraviolet, featuring an art inspired installation and gorgeous floral halo design by Evergreen Flower Co. Our sweet couples, Ellen & Colin and Krissie & Mike joined with their closest family and friends to get married in 2 intimate celebrations in our studios! We currently offer 2- 3 Popup events per year. We choose the date, the theme, the decor, the vendors, you answer a few questions, pick out what to wear and who to invite, show up with 20-40 of your most loved ones and get married!If you are feeling so overwhelmed by wedding planning you can’t even deal, if you want a stylish wedding without all the fuss, if you can’t afford a big a wedding or just want someone else to take care of everything for you, a popup wedding might be for you! It is always a joy to create for people we love! Ashlynn has been an extension of our family for several years, she has cared for our little ones and loved us hard in as a single lady, and when she and Taylor started dating seriously we were so thrilled for her to find someone who was so well suited for her! They are both among the sweetest, most joyful and faith-filled people we know. 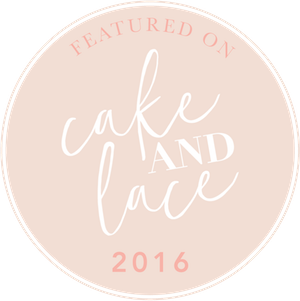 She immediately got in touch about using us for her wedding (she was in attendance at Ali and Ryan's wedding last year and was smitten with the decor we did for them). 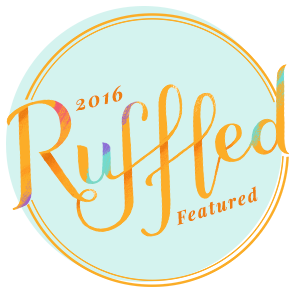 We recommended some of our favorite vendors and they trusted us implicitly with their vision for their day! Ashlynn and Taylor chose Simon Kenton Inn, a charming little venue in Springfield, OH. 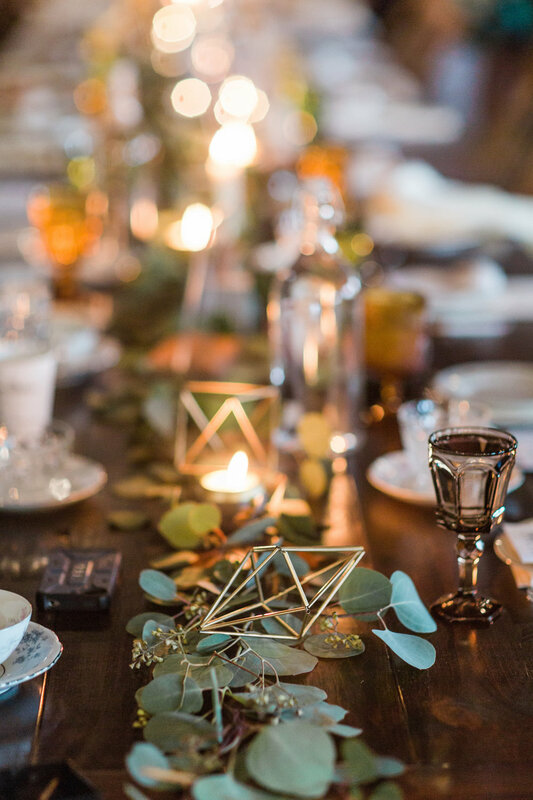 Evergreen Flower Co. created elegant centerpieces for half of the tables and some stunning arrangements for the ceremony, while we outfitted the others with our Geometric Copper Lanterns, Acrylic Table numbers and dyed gauze runners from Linen Lark. 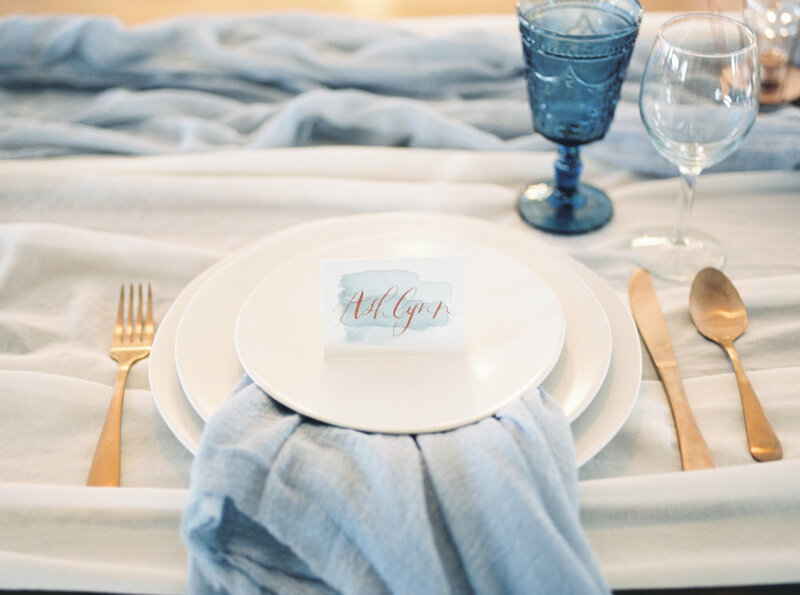 Our blue vintage style goblets adorned the place settings and we tied gauze ribbons around the napkins for a pop of blue. 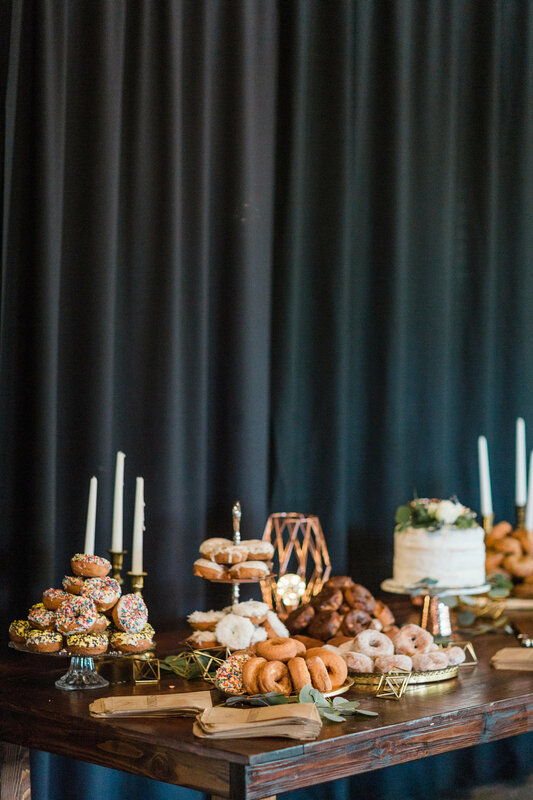 Our Donut Wall from Ali and Ryan's wedding created the dessert display, and custom watercolor place cards adorned the sweetheart table, along with our Heirloom plates and copper silverware. Our copper pipe seating chart holder was decked in matching gauze to which we pinned the seating chart! Chloe Luka photographed everything beautifully and we were able to actually attend the wedding which was full of love, worship, Christ centered celebration of family, friends and marriage! Congratulations Ashlynn and Taylor, we love you and are so thrilled for you! Thanks for including us in your beautiful day! When Katie first came to me for a consultation she exuded warmth and kindness and I immediately felt a kinship with her artistic spirit. She's easily one of the most sweet and authentically kind people I have ever met, and it was pure joy every meeting with her over her wedding planning process. 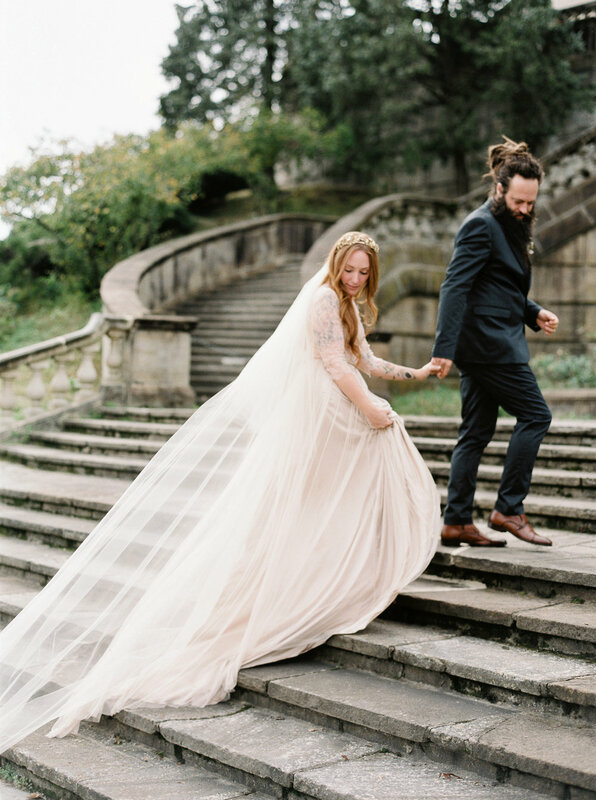 She had a romantic, artistic vision for her wedding day that I couldn't wait to be involved in. 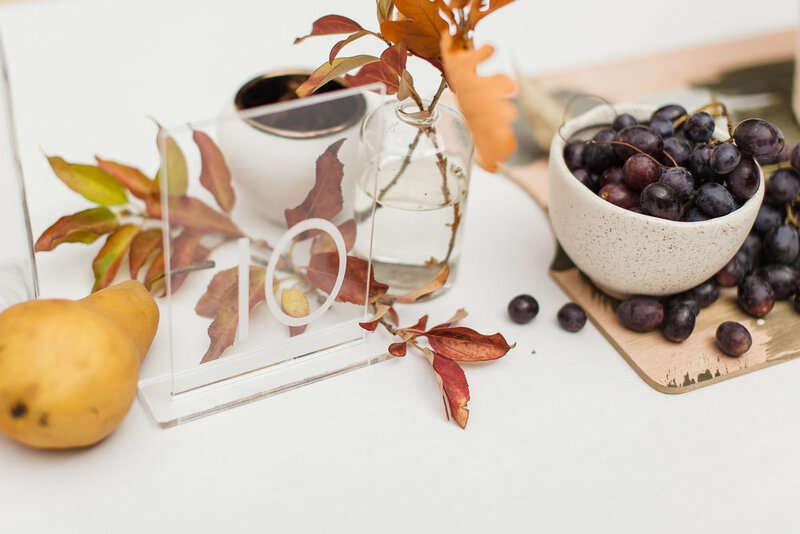 A venue change shifted our original plan, but we worked together to plan a dreamy tablescape for their sweetheart table and a few other details sprinkled throughout at the Dayton Art Institute in Dayton, OH last October, 2017. Our mantra throughout our meetings was that "none of this really matters!" I believe planning your wedding should be fun, joyful, a celebration of your love. 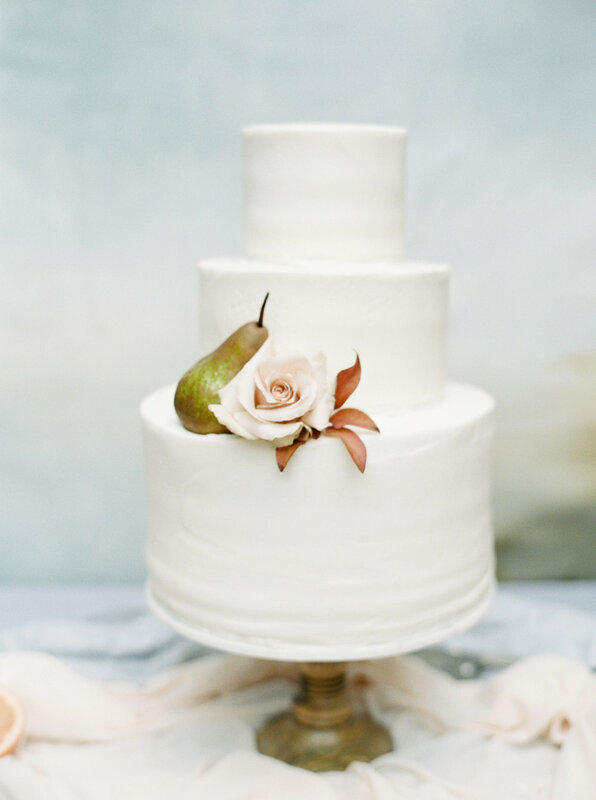 The fact that you're getting married is the important part, everything else is just icing on the cake (no pun intended :P)! I always want to direct your attention back to that singular fact, and even though we are obviously in this industry and our business relies on weddings, we want our couples to retrain their focus back on their marriage and actually ENJOY their wedding planning! Once we get there, and you can trust the vendors who are looking out for you, it's so much easier to create a beautiful day and celebrate the things that are most important rather than getting bogged down in details that do not matter in the long run! 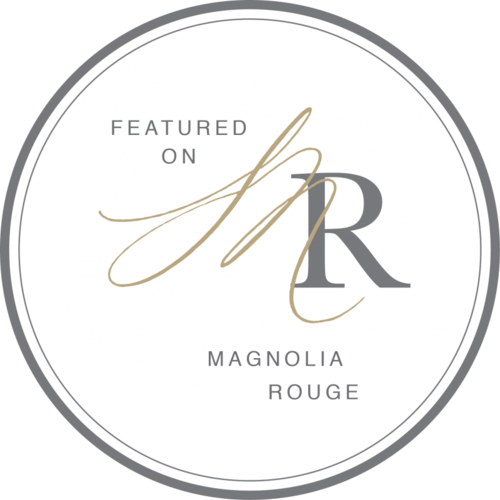 Katie chose our studios for her bridal party to get ready for the wedding, and made use of our Flora sofa (a favorite of hers since our early meetings) for some portraits with her sweet family and friends. 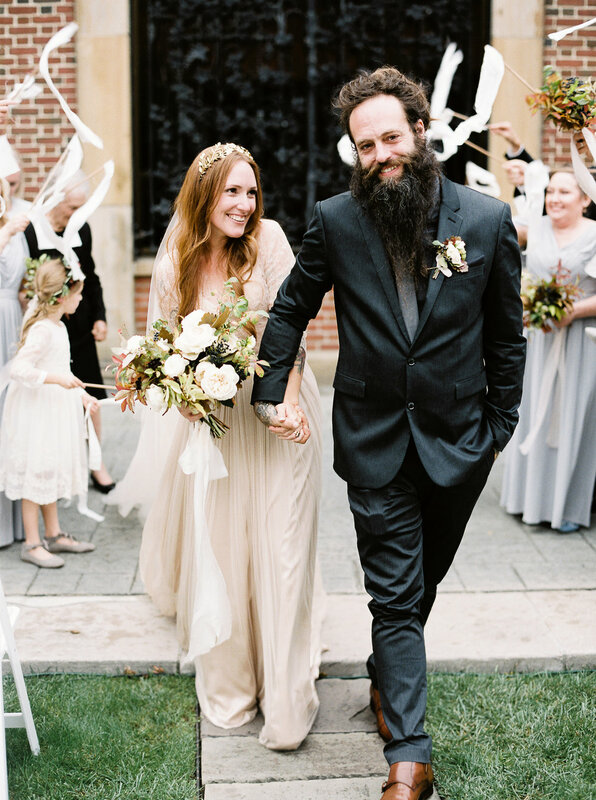 Jenny Haas captured every detail with grace and beauty and composed some seriously stunning images of the happy couple! 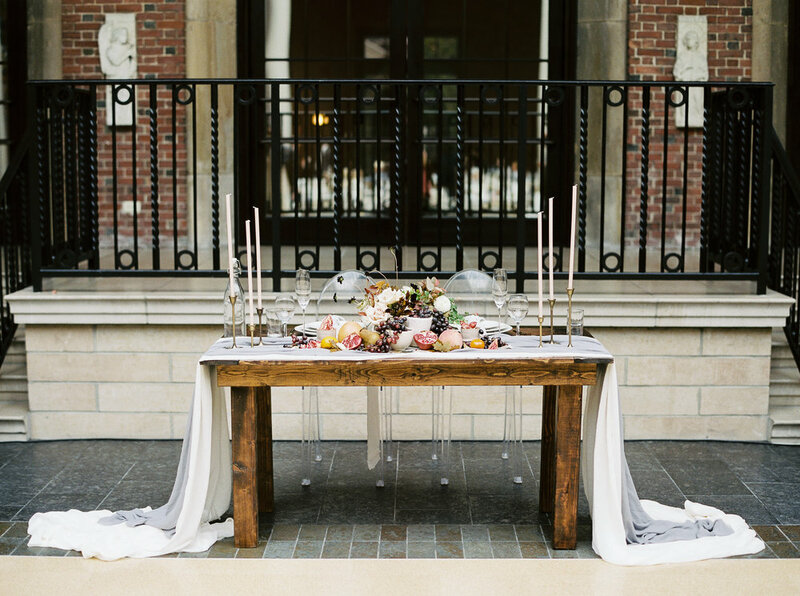 We used our sweetheart farm table and acrylic chairs to set the stage for Katie and Matt's own personal table. Our organic Heirloom plates have a handmade feel to them that Katie was looking for, and she made gray gauze napkins for each pace setting. We ordered beautifully unique, custom colored skinny candles from Bark and Berry on Etsy which helped accentuate the head and dessert tables. 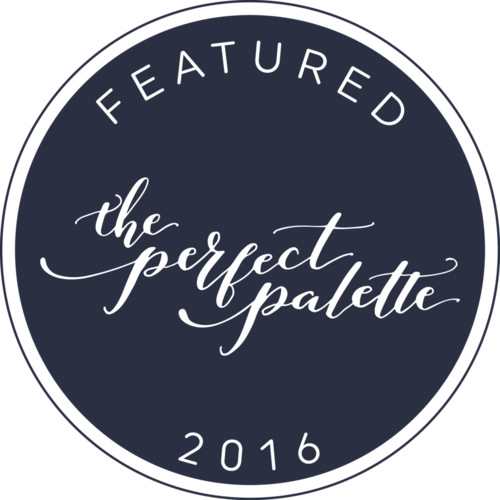 Katie worked with Evergreen Flower Co. to create centerpieces inspired by the Dutch Masters (classical painters) with a modern twist, using palettes she painted in the colors of the day, fresh fruits, flowers and ceramics making each table a work of art in and of itself. We arranged a still life on their table with the beautiful offerings that Evergreen brought in. Katie is a fantastic painter and has done some beautiful large scale work, she designed her own invitations and even created an amazing landscape backdrop for her cake table to offset the darker brick of the venue space and bring in a bit of the outdoors. Her now husband Matt is also an incredibly talented tattoo artist and owner of Aisle 9 Tattoo in Centerville, OH. 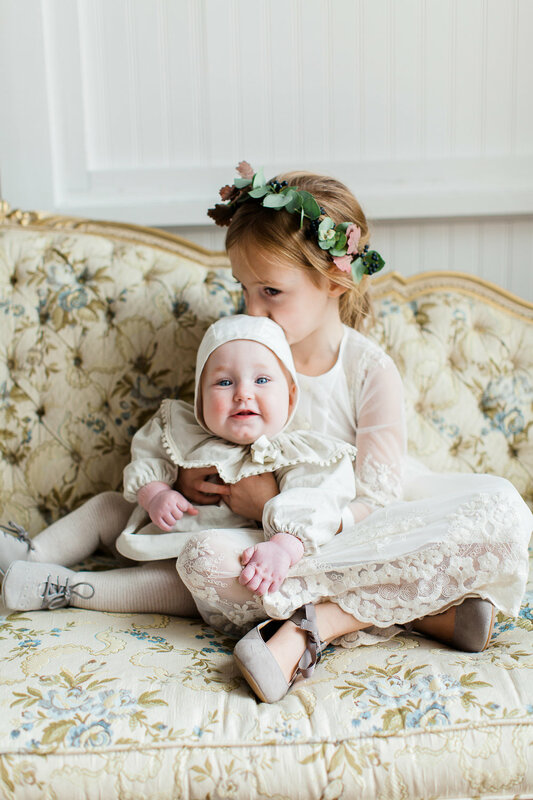 Their two children were involved throughout the day and their love for their family is evident in every image. Every detail was thoughtfully chosen, with history and emotion and love and aesthetics all woven together to create a truly unique and absolutely beautiful event. 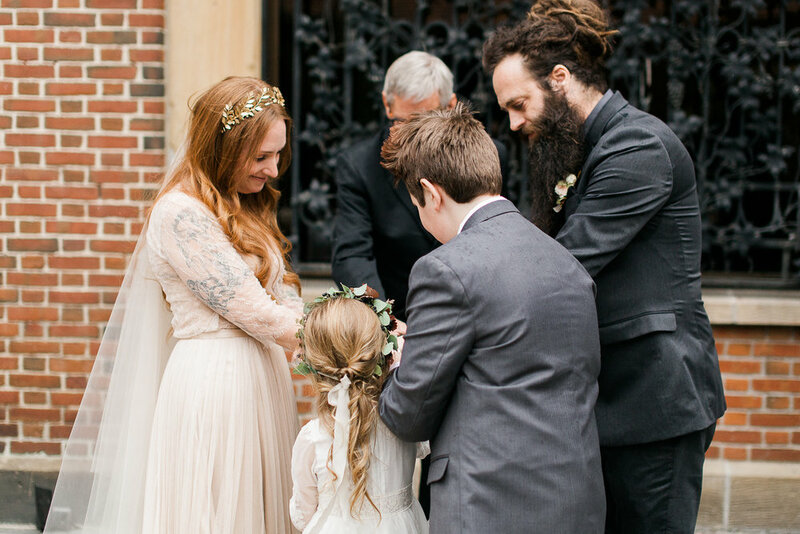 We're so grateful to have been part of this lovely wedding, congratulations Katie and Matt! We first met Ali and Ryan shortly after we moved into our first studio in 2016! 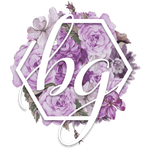 They were very early clients and one of the first to take one look at our inventory and social media presence and trust us implicitly to decorate their wedding! We connected with them from the first moment they sat down with us and tot his day I am so grateful they took a chance on us entrusting us with SO MUCH of their wedding day. They had to deal with a last minute venue change but took everything in stride with such joy and ease, and were a delight to serve! 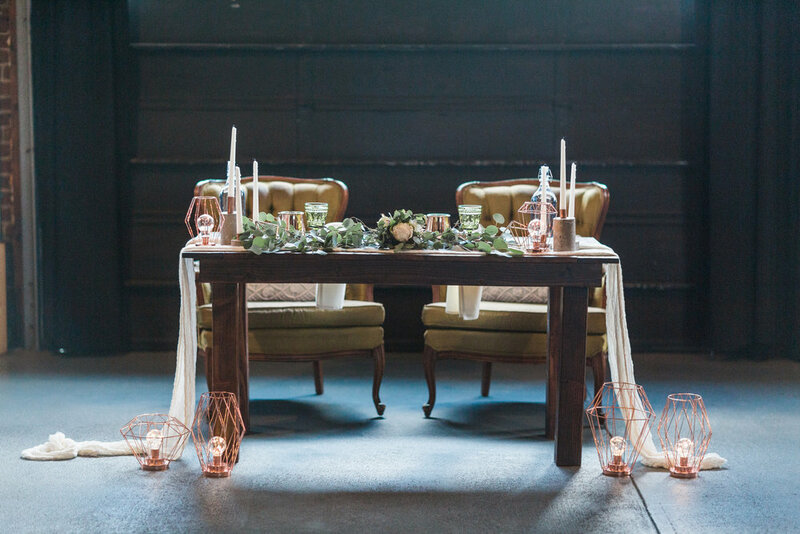 They had seen a styled shoot we'd done and were heavily influenced by the decor, choosing our wood farm tables and vintage folding chairs, our handmade cement candle holders and copper pipe arbor and seating chart holders among many other details from our collection. 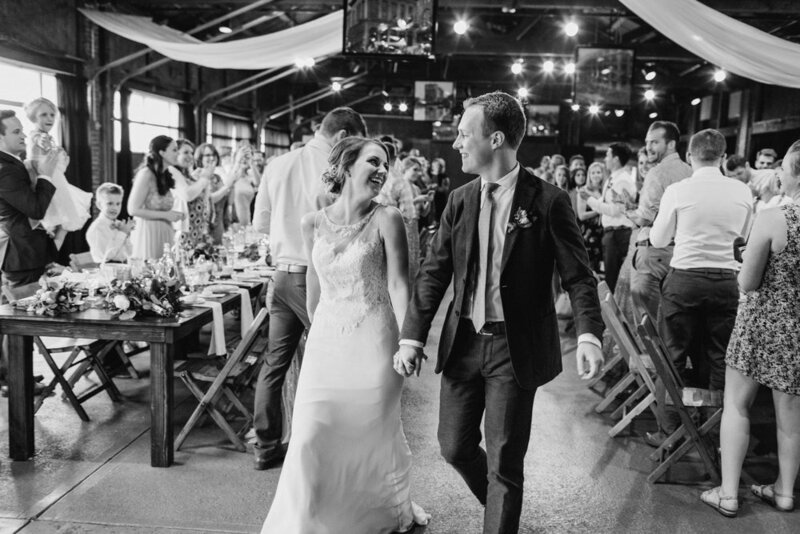 Their Mother's Day wedding was our first of many weddings since at local venue Top of the Market, an industrial dream in downtown Dayton, OH! We love working at this venue and it perfectly complements our collection. They brought in delicious donuts from local favorite Bill's Donuts for dessert, Ali and her mom made their own cake. Graphic designer Ali designed all the stationery and print materials, and even hand lettered a banner and every guest's name onto a smooth stone for their place cards (over 200!) Enjoy these photos by their wonderful photographer Chloe Luka!